Good Morning fellow quilters! We'v got a lot of information to cover so let's jump right into this March newsletter. 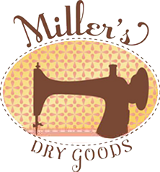 Will you be joining us at the Sewing & Quilting Expo held at the Cleveland IX Center on April 4-6? We've already started prepping for this event and we'd love for you to come visit us. Our totes are already filled with those yard pieces that you love so much; they're just waiting for you to come sort through them! We'll also be giving away a few free tickets to the Expo, so make sure to keep an eye on our Facebook page for when we launch more details. 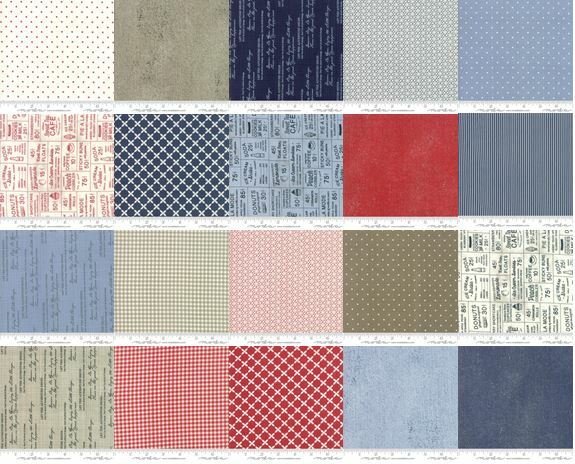 Northcott is celebrating the 10th anniversary of their Stonehenge fabric brand. To do so, they've organized the Stonehenge International Block Party that includes quilt shops from all around the world. And guess who's decided to join in on the fun? That's right. We have! Each participating shop (us included) has designed a unique block pattern using fabric from the Stonehenge Solstice Anniversary collection. 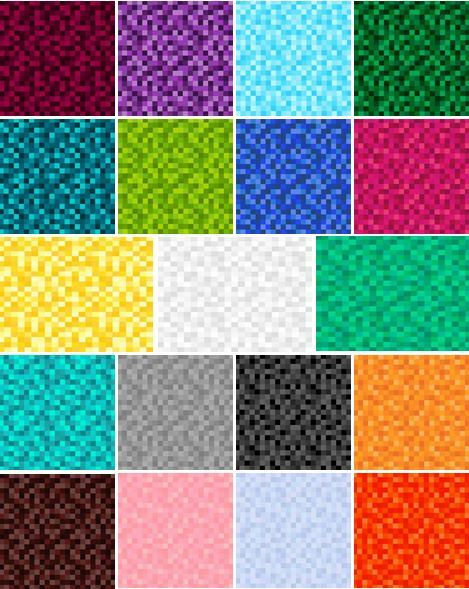 Starting March 15th, 2019 and ending September 30, 2019 these patterns will be kitted with the fabric and be available for purchase. Our block is pictured below. Now, this is where the fun starts...there are two contests that you all can participate in, during this time. And yes...there are prizes at stake! We'll outline the main details for each contest below and if you have further questions, visit Northcott's website for more details. The challenge: collect and use at least 12 different blocks in a quilt design for the International Stonehenge Block Party Challenge. 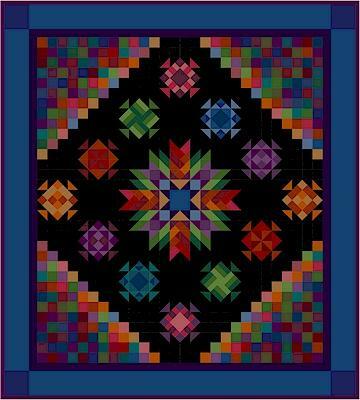 All blocks used in the quilt design must be from shops you've visited and collected from. To qualify: the quilt front including the binding must be made of 100% Stonehenge fabrics from the Solstice Anniversary collection with the option of including: Stonehenge Gradations Oxidized Copper palette and Stonehenge Gradations Robin's Egg SKU 39300-79. The quilt backing can be any fabric of your choice. The deadline to submit your quilt design via Northcott's online submission page is DECEMBER 31st, 2019. As part of your submission, they will ask you to include a short description about the blocks you used and list the shops they were purchased from. Judging: The Northcott Judges will select 10 finalists by January 31st, 2020 and have them send in their quilts for a final round of judging. They will choose a 1st, 2nd, and 3rd place winner by February 28th, 2020. They will judge the quilts based on: the use of the Solstice Blocks in the quilt design, overall impression, workmanship, and creativity. 1st: The grand prize will be a 9-day Trip for two to England with a private tour of Stonehenge in June 2020. The challenge: to use the Solstice panel in a creative way to make a quilt no larger than 60" x 60" for a contest run in each participating brick & mortar shop. -Each shop runs their own in-store contest. 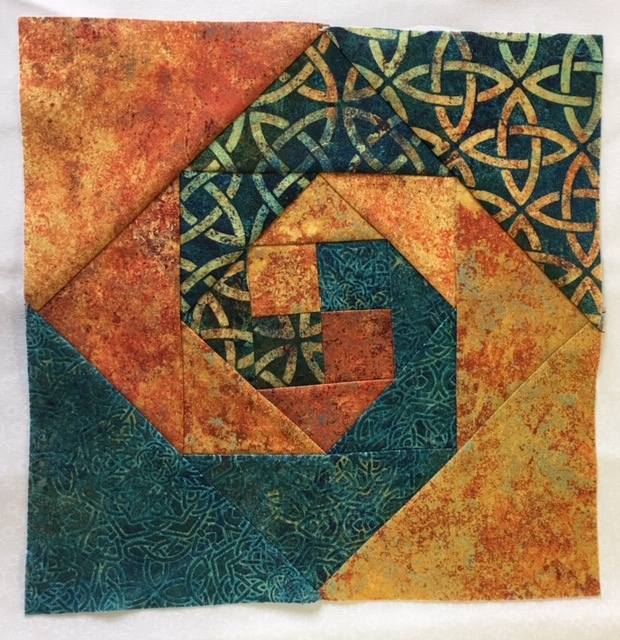 -The solstice panel quilt can include other fabrics from the Anniversary collection, fabric from the Stonehenge Gradations Oxidized Copper palette and the Robin's Egg SKU 39300-79. -Submission: Panel quilts are physically submitted to that shop only, and that shop chooses their winner. The deadline to submit your panel quilt to your local quilt shop is NOVEMBER 30th, 2019. You must deliver your quilt to the local shop by this date. Each shop will then choose a winner by December 9th, 2019. Shops will then submit a picture of their winning quilts to Northcott by December 14th, 2019. From these submissions, Northcott will select 10 Solstice Panel Quilt winners in January 2020. These 10 winners will receive: A Stonehenge fabric prize with a retail value of $100 USD supplied by Northcott. For more on contest rules, restrictions, guidelines, etc. please visit Northcott's website. We're switching things up just a bit this year. Our in-store St. Patty's Day event is going to be a bit different from what it has been in the past. This year our event will be held on Tuesday March 19th, two days after the actual St. Patrick's day. Here's the great thing about Tuesdays....beginning in 2019 Tuesdays are now Double Punch Tuesdays...which means you get double the punches on your loyalty card (this is only in-store, online and phone sales don't apply). If you don't have a punch card, we'd love to help you start one. Just ask for more information at check-out! Make sure to stop in, see us, and join in on the fun! We are offering another limited number of sign up spots to join the Amish with a Twist IV block of the month program. Orders for this round will start shipping in the middle of march and include the first three months kits to be on track with everyone else. Each kit thereafter will be shipped on a monthly basis. B) To pay for the full year up front online for an overall savings of $30. The cost for this is $170.00. You will still receive the Starter Kit in March and then the rest of the kits on a monthly basis, you're just simply paying it for all up front. Finished size is 88" x 98". Shipping on the Starter Pack will be Mid-March. Included in this first shipment is the pattern book, a large spool of Aurifil thread, and the first, second, & third months block kits. 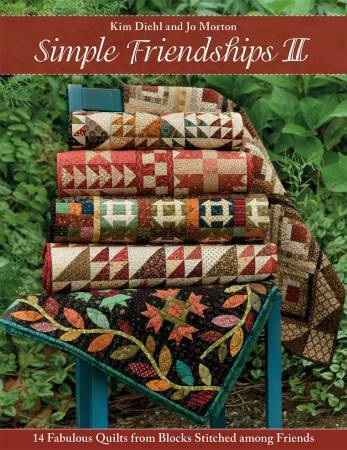 Included in this program is everything that you need to complete the quilt top as well as binding with the option to purchase backing and batting at the end. (We will send out an email about this offer announcing all the details when we near the end of this project. If you are purchasing the starter kit and not paying for the full year please contact us to set up billing for the remaining months. Call 330-893-9899 Mon-Fri from 9am-5pm EST. Each month will be $10 plus $5 shipping. You are also welcome to pick up your block kits in store each month if you are local. This program is online only, discounts do not apply. You scream, I scream, we all scream for ICE CREAM! 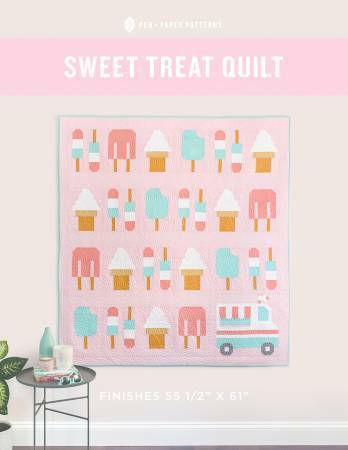 This sweet treat quilt is perfect for summertime(or all year long if you ask me). Complete with ice cream cones, popsicles, ice pops and an ice cream truck! And if you're not into ice cream (gasp!) there's a bonus pattern with tacos for you to try! From Suzn Quilts comes a quick & easy, "sew as you go" project that only requires 1 jellyroll and 2 yards of backing. Enjoy the ride as you "drive" your sewing machine to sew these strips together, creating a scrappy style quilt. Finished size: 42" x 68". Are you ready for another Kim Diehl and Jo Morton collaboration? Ready or not, here it is. This round, Kim and Jo have picked 6 quilt blocks (Flock of Geese and Ohio Star to name a couple) and have each created a quilt using said quilt blocks...for a total of 12 different quilts! PLUS they've each created a sampler quilt...which brings the grand total to 14 quilts for you to pick from. Three purposes fulfilled in one kitchen accessory. 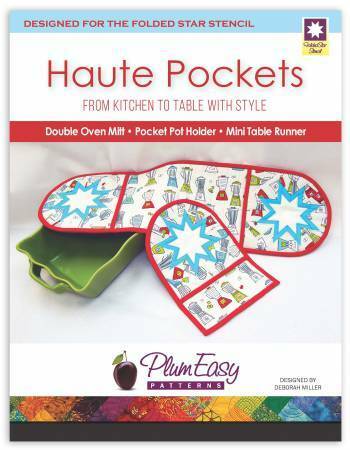 Haute Pockets work as a double oven mitt, pocket pot holders, and as a mini table runner for your kitchen table. Use Plum Easy's Folded Star Stencil to help you create this fancy set of hot pads. Skill Level: Confident Beginner to Intermediate. Expand your horizons and try something new- like creating giant quilt blocks instead of tiny ones. 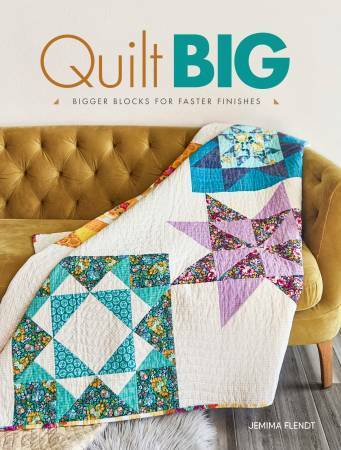 Jemima Flendt, in her book 'Quilt Big', shows you the advantages of creating bigger blocks. Larger blocks are easier for beginners to sew and they give your overall quilt a more modern look. Not to mention, sometimes in smaller blocks your favorite fabric's print gets lost because it's cut into such tiny pieces.However, with giant quilt blocks your favorite prints can be showcased and stand out. 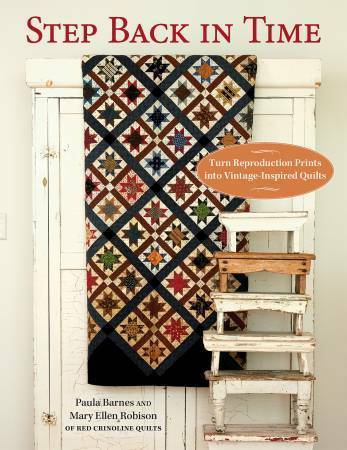 Travel back to the 1800's in the latest book from Paula Barnes and Mary Ellen Robison of Red Crinoline Quilts. With each of the 13 projects presented, you'll find a story to go along with it. The designs are vintage and scrappy in nature and are a perfect way to use up the scraps that have been hiding in your stash for so long. A handy dandy tool to have around. This little guy can be attached to your sewing machine, serger, quilt frame, or thread caddy so that it's around to cut your thread whenever you need it. Insert thread into the opening and pull down over the blade. It'll save you from always having to have a pair of scissors nearby. Meet your new basting bestie. 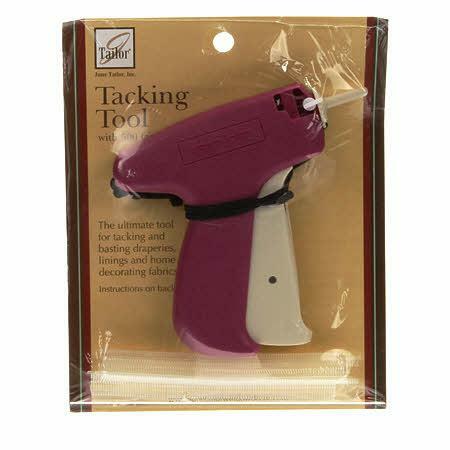 Rather than using pins to hold your backing, batting and quilt top together, the ultra fine needle found in this basting gun applies plastic fasteners to quickly and securely keep the layers together. It's also great for other craft and at home projects. 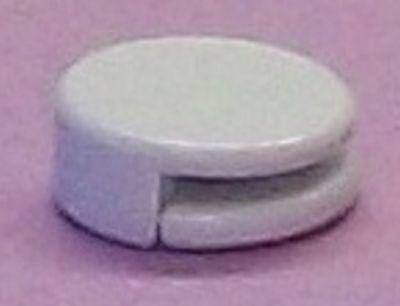 And when your finished, simply clip the fasteners with a scissors to remove them. Bonnie and Camille are back at it again, creating lovely prints full of flowers and spring & summer colors. This time they've thrown a sewing theme into the mix with designs featuring measuring tapes, "bias tape" (gingham print) and "little stitches" (x's). Colors include: red, lime green, pink, aqua, and charcoal. 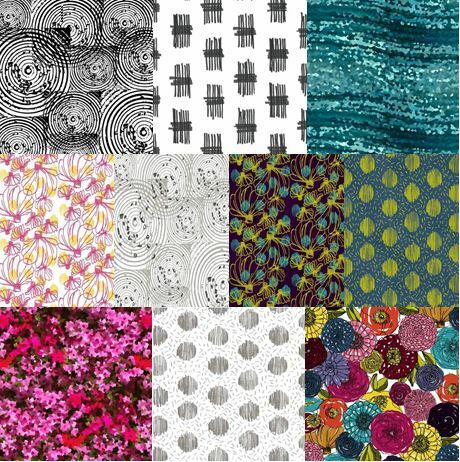 Made up of many, many colors and one print, the fabrics from the gemstone collection are great prints to be mixed into other quilts. The various hues of one color within each print make them good candidates for blending into other collections and their color schemes. The queen of 19th century reproduction prints strikes again. Rose buds, pansies, dots, stripes, and leaves all make an appearance in this scrappy style collection. Red, rose-pink, brown, dark blue, steel blue, mustard yellow, and tan help bring it all to life. 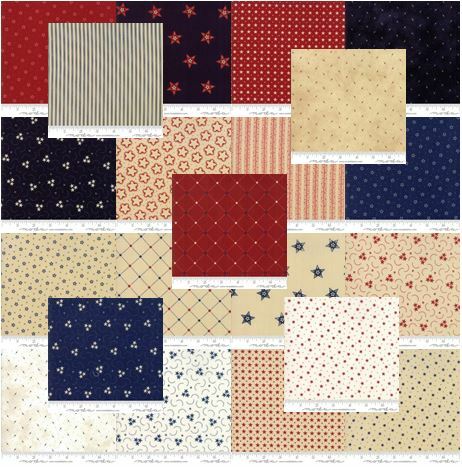 A timeless collection with patriotic flare, Star & Stripe Gatherings is full of, you guessed it, stars and stripes. A second, darker blue color along with a tan color adds an extra dimension beyond the typical red, white, and blue typically found in Americana collections. 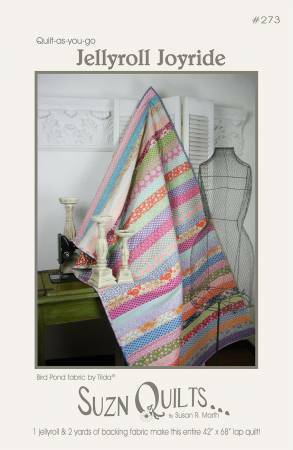 For project ideas, we've got a Star & Stripe Gatherings book available for purchase here at the store. Calling all Lori Holt fans! Her latest collection is here! And it's brimming with bright, happy colors like orange, pink, blue, and green. 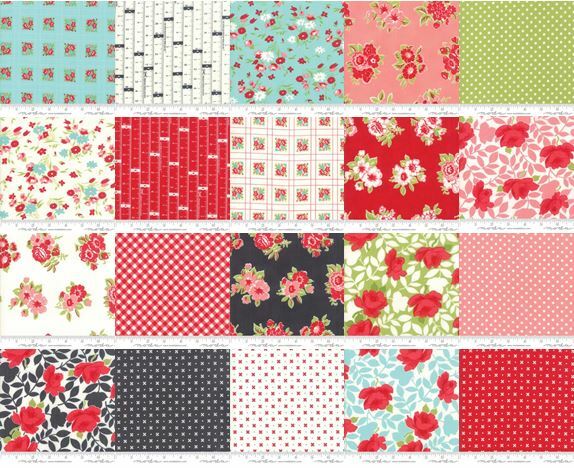 Mini floral prints, along with small geometric and bandana prints add variety to this shabby chic collection. Heat waves, picnics, old fashioned ice cream shops, and back road driving all come to mind with Sweetwater's newest collection, named after a classic summertime drink. 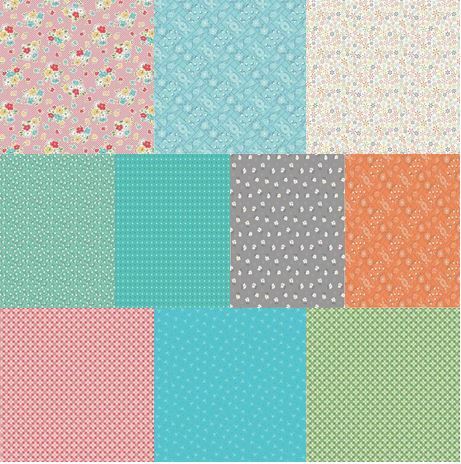 Prints include: plaid, lace, lattice, polka dots, and reminders to "choose happiness". The color scheme: red, taupe and blue. Modern and abstract, this collection takes items and elements like ripples in the water, chicken scratch, a summer dress, family trees, and front gates and translates them into an art form on fabric. It includes both neutrals (like black, white and gray) and vibrant colors (like blue, magenta, orange, yellow, and hot pink) giving it versatility. 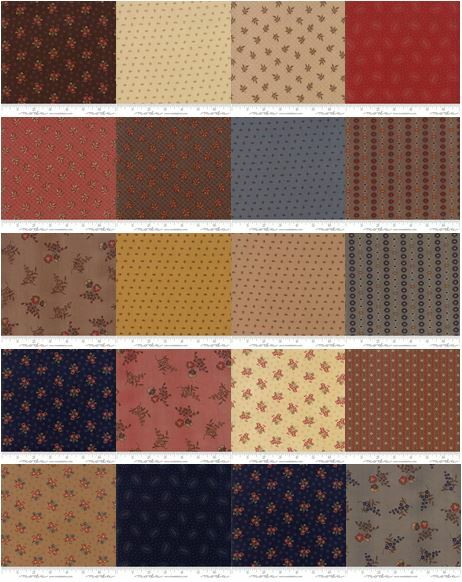 The latest Kansas Troubles collection has arrived at our store, and along with it a hint of spring. 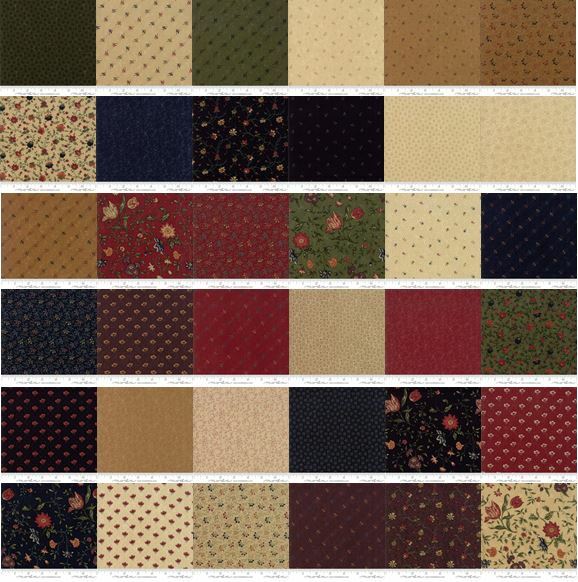 As with other Kansas Troubles collections, the colors used are warm & inviting; you'll find red, black, dark blue, green, plum, gold, and tan all within this one collection. Flowers both large and small are scattered across this collection giving it a truly springtime essence. From the designers that brought you Farmhouse Reds, comes their newest collection called Crystal Lake. 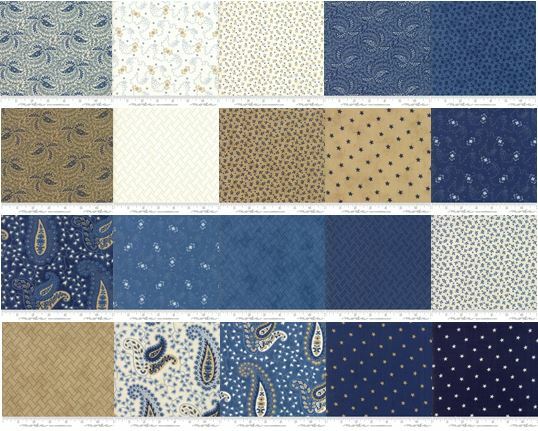 Minick&Simpson have decked out their latest collection in a sea of blue with a few added touches of tan and ivory. Prints include paisley, stars, clouds, and various floral elements. Regular Hours (March-November) : 8-5pm Mon-Fri. // 8-3pm Sat. // Closed Sun. Winter Hours (December- February) : 9-5pm Mon-Fri .// 9-3pm Sat. // Closed Sun.